Jill Marissa in Compos Mentis. Manifold Motion has a knack for combining scenic elements to create visually engaging and fully immersive performances. In many ways, the company succeeded with their latest production, but sadly the work fell short a bit, as well. 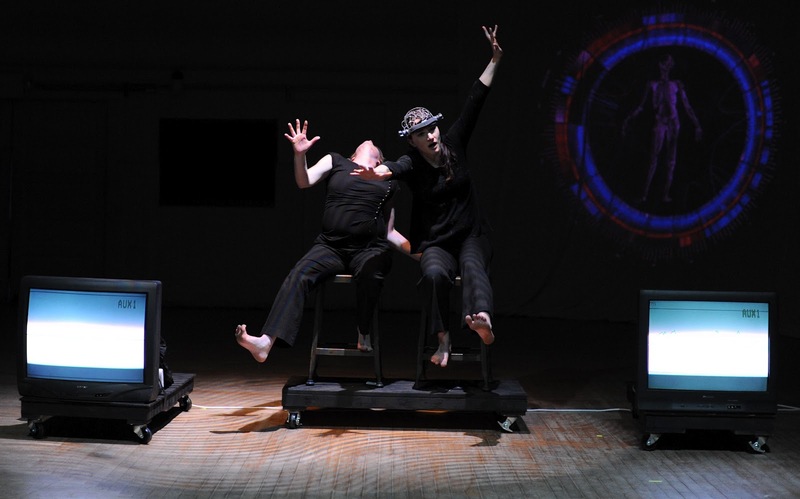 On March 18, 2012, Manifold Motion presented its newest work, Compos Mentis, which explores the dilemma of a human’s search for spiritual peace. In this work, the company utilizes a combination of video, elaborate props, and original music compositions to completely immerse the audience in the Manifold world. In the beginning, Monica Mata Gilliam’s arms emerge from baby blue fabric, which hangs from the ceiling at Washington Hall. Her fine hand gestures conjure an image of floating through clouds—a representation of the universal peace humanity seeks. A projection of magnified cells drapes the background as Gilliam steps out of the blue fabric attached to her tunic. The soundscape creates an atmosphere that spurs the mind to contemplate the middle of the universe where Gilliam seems to float and peace reigns. She twirls away from the hanging fabric and her limbs reach out into infinite space, yet she returns to her roots by wrapping herself back into the cocoon of the fabric. As the lights soften, Gilliam kneels on the floor and stares toward the opposite half of the stage. Brynne Flidais, wearing all black, methodically arranges mugs on the floor. She loudly places each mug right-side-up, then flips it upside down with a loud thud and twists it into place. Keely Isaak Meehan enters and arranges her legs in contorting angles, pouring her body through the sea of mugs. In a different approach to these obstacles, Flidais makes her way through that same sea, balancing precariously atop each mug. The twinkling of ambient kitchen noises is suddenly overlapped by the sound of smashing ceramic as Meehan inexplicably begins hammering the mugs, destroying the maze through which she had been sliding. This idiosyncratic image is echoed by Jill Marissa, perched on the balcony that surrounds the room, robotically stacking pillows along the ledge. These mirrored mechanical movements suggest a repressed state of mind. Keely Isaak Meehan and Jill Marissa in Compos Mentis. The focus shifts as a projected image of the brain appears and Fildais reenters wearing a white doctor’s robe. She places two TVs on stage that display Meehan and Marissa’s electroencephalography. Both women shake and contort to Nintendo-like music with recording nets on their heads. The scene depicts human behavior in search of nirvana and the absurdity of meta preoccupation—the paradox of causing stress by worrying about not reducing stress levels. Meehan and Marissa’s over-exaggerated acting mocks this absurd situation, especially as Gilliam is at the back of this display trying to send her positive energy to these ladies with floating arm gestures. In the next scene, Meehan walks back and forth in a rectangle of light, gradually exchanging her black garments for white ones. This beautiful moment of silence reflects the search for spirituality through the many layers of self-identity and is easily the most genuine choreography of the entire program. Next, Flidais walks toward the audience, her face a mask of anger, disappointment, and overwhelming sadness. Her hands, wet with black ink, leave marks on her skin as she repeatedly flagellates herself and painfully rubs her chest. Before Meehan and Marissa come to her aid, she spins wildly, seamlessly ascending from and descending to the floor. Compos Mentis reveals diverse sceneries of quests for spiritual truth with beautiful video and lighting, yet much of it lacks nuance and becomes too literal. The dancers’ depictions left little room for actual choreography, which could have lent more texture to each idea. Manifold Motion attempts to convey this concept in so many different ways, that it over-saturates the audience. Each depiction is a clever exploration in and of itself, but piled up they make the idea seem redundant and some value is lost. Compos Mentis can be seen at Washington Hall March 23 through 25, 2012. Tickets are available through Brown Paper Tickets.